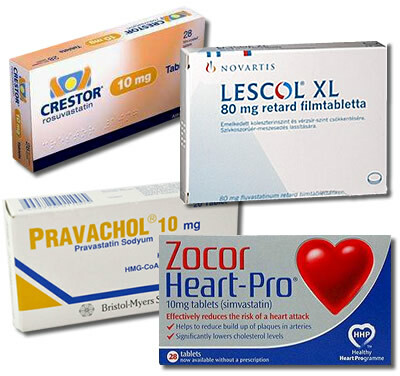 Mevacor (medical name Lovastatin) is a medicine that helps patients to lower cholesterol in their body and they need to keep a suitable diet along with it. Some patients use it during angina to prevent the pain in chest and a risk of having a heart attack. This medicine helps to prevent the blockage of blood vessels and therefore to eliminate the option of having an operation for opening heart blood vessels. Your doctor can determine the other conditions for which it may be used. 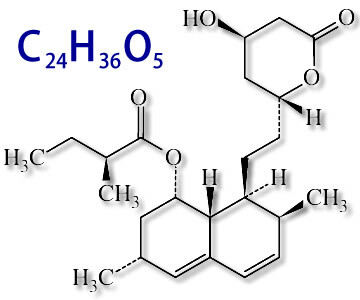 Lovastatin belongs to the medicine-group named HMG CoA reductase inhibitors. Sometimes they are called "statins". 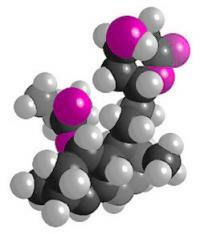 This drug makes the content of "bad" cholesterol or low-density-lipoprotein lower. It also reduces the content of triglycerides in your blood and raises the content of "good" cholesterol or high-density lipoprotein at the same time. Patients with such conditions like coronary heart disease, diabetes and other risky conditions take this medicine to reduce the risk of having a heart attack, stroke or other difficulties. It can be taken by adilts and kids that are older than 10 year old. 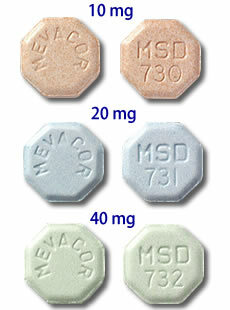 Merck and Co. Inc. produce Mevacor in pills of two doses, one in 20mg and another in 40mg. There was a time when you could see 10 mg pills of Mevacor, but they don't produce them any more. 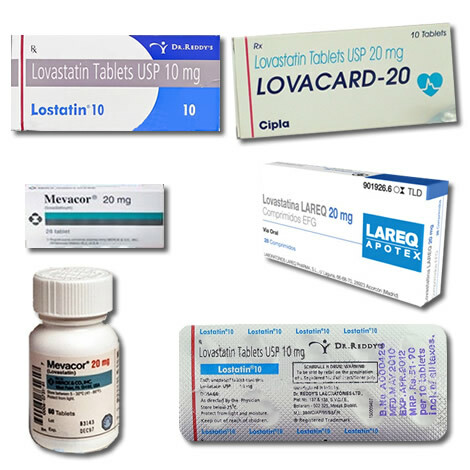 In the meantime there is 10 mg tablets of generic lovastatin are sold. The results of previous researches showed that patients that took in the evening a 20mg pill of Mevacor, could make the content of LCD cholesterol lower on 27% and the amount of total cholesterol lower on 19%. These tablets showed that they can raise the amount of HDL on 6%. As for triglyceride, it went 9% up at this dose. When patients took another dose, triglyceride went down on 27%. A higher dose of Mavacor effects more on the levels of triglyceride and cholesterol. Patients take Mevacor to decrease the amount of high cholesterol in their body if they cannot do that during an appropriate treatment. The medicine can do both, rise up the amount of "good cholesterol" and make the amount of "bad cholesterol" lower. The studies showed that Mevacor can decrease the levels of triglyceride in your blood. 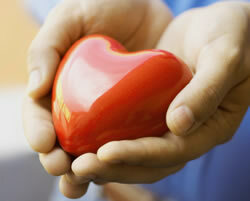 People treat the amount of cholesterol in their body together with the changes of their lifestyle. It can be different physical exercises, loss of weight or a special diet with low cholesterol. If all of these changes of lifestyle do not help you to lower your cholesterol to a necessary level, than it is necessary to take Mevacor. 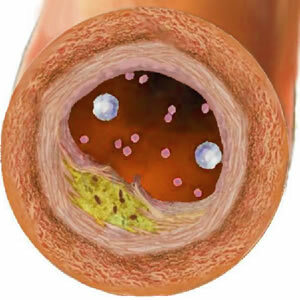 People that have atherosclerosis can make the rate of having it much lower after taking the medicine. Mevacor has an approval to cure high cholesterol in kids that are from ten to seventeen and that have a hereditary disorder, that they name heterozygous familial hypercholesterolemia. Young ladies should take the medicine not sooner than they have their first period. We kindly ask you to not to set up a dose for yourself, only if your doctor gives you the instructions on how to do this. You should eat something before you take this medicine because it can make the level of it in your blood much lower. It is better to take Mevacor when you are having supper. The liver makes a lot of cholesterol when it is night, so you should take Mevacor during evening for a better effect. You should understand that you can help lower the level of cholesterol by changing your lifestyle. It means: exercises, loosing weight, dieting with food that contains less cholesterol. It will not really help if you just change your lifestyle, you should also take special medicine like Mevacor if you want to decrease the level of cholesterol to the necessary point. Be sure to follow all the instruction that were prescribed by your doctor. The medicine will be useless if you interrupt your treatment. When you have some regrets about Mevacor of how to dose it, you need to go to a healthcare provider, pharmacist or nurse for consultation. 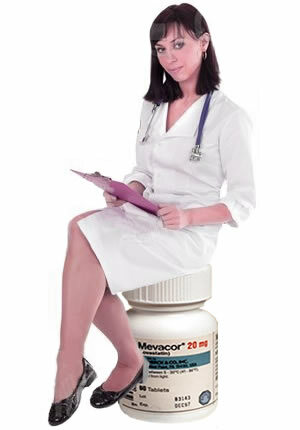 It is forbidden to interrupt treatment with Mevacor unless your doctor says so. People that first started to take Mevacor, should go with a 20mg dosage one time in a day and they need to take it during supper. When some weeks pass, your doctor could ask you to check the level of cholesterol in your blood once again. After you received the results, you had seen that it is not the level you want, the doctor may advise you to make the dosage of the medicine higher. He could also reduce Mevacor dosage if you noticed that you experience some side effects that bother you. Usually the dose of Mevacor could vary from 10 mg to 80 mg one time a day. Sometimes they divide it into two intakes. You can take maximum 80mg of Mevacor a day. Children that are from 10 to 17 are recommended to take one time a day a dose of 10mg or 20mg Mevacor pill. When you see no results with this amount of starting dose, you should ask the doctor to increase it. Sometimes, he can decrease the dosage if you noticed side effects. 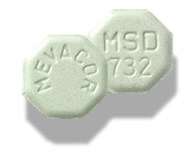 Children can take maximum 40mg of Mevacor one time a day. It is necessary to let the doctor know if there are any other medications that you are using. That may include medicine that is sold by prescription or not, all herbal additions and vitamins. Immediately got o your doctor or call him in case you felt pain in muscles, dizziness, aches in your body or abnormally high body temperature. 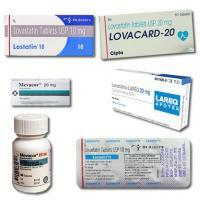 Have allergy to lovastatin, Mevacor or to some of the components that are inactive and they use them to produce this medicine. Your doctor should have this list. Are going to have a baby. 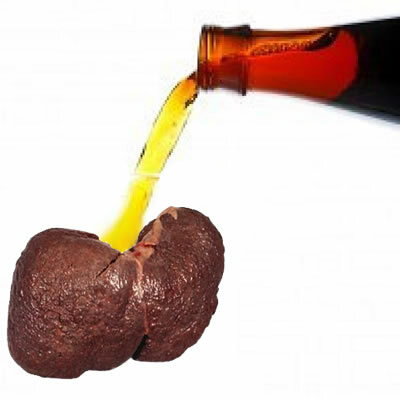 Have a disease of liver that is active or enzymes. Before you begin your treatment with Mevacor, you should talk to your doctor if you are addicted to alcohol or you drink too often. Statins are proteins that make the quantity of liver enzymes grow. This leads to the damage of liver. This is why before you begin treatment with Mevacor, you should make all the blood tests that can tell how your liver works and then, after some months of your treatment you also need to do this test. 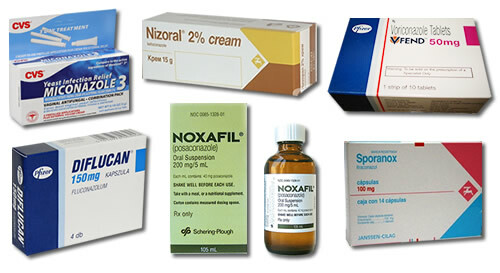 We also recommend you to fulfill them when you change the dosage of Mevacor. It is possible that the medicine can cooperate with a list of other drugs. There were rare cases when people took Mevacor or some other statins and they reported that they have dangerous problems with their muscles, like rhabdomyolysis. When you started to feel pain in your muscles, dizziness, high body temperature or sickness, you should immediately go to your doctor. This drug belongs to the medicine of Category X. It means that it could probably damage the child you are bearing. It was not ascertained that Mevacor is safe for women that are pregnant. The doctor needs to know if you are going to have a baby. For those people that have an inherited disease that is called homozygous which is also known as hypercholesterolemia Mevacor could not be very effective and sometimes may bring side effects. It also has not been found out if Mevacor passes through the breast milk, when you are feeding. The doctor should decide if you need to finish breastfeeding or interrupt treatment with Mevacor. Mevacor has side effects like any other medicine, but they can occur not to all patients. Actually, most patients don't suffer. When they do have some effects, they are usually not big and don't need to be treated or your doctor can treated very easy. There were made some researches and they showed that about 4,6% of patients interrupted to take Mevacor after they experienced side effects. You should immediately contact your doctor when you felt that you are getting sick, high body temperature or pain in muscles after you started using Mevacor. Mevacor was largely tested and researched during lots of trials, when they evaluated a huge number of people. The scientists observed side effects of people that took Mevacor and those that just took a placebo. After those observations, they took notes and made comparisons. At this condition it is better to notice what kind of side effects happen to people and how they differ, comparing to those patients that took placebo. Allergies, and all the types of its signs like appearance of skin rash, eruption, itching, hard breath, hissing respiration, your throat, mouth or tongue swells. Evidence of problems with your liver, like: yellow skin or eyes, pain in the right side of your body, high liver enzymes, dark urine. Pain in muscles, dizziness, sickness and high body temperature. These all can signify that you could have rhabdomyolysis which is a dangerous disintegration of muscles. Changes in your urine, like its amount or color, which may show that you have problems with your kidney. When clinical studies were made, it was found out that only one percent of patients had some side effects when they took Mevacor. These side effects happen so rarely that sometimes the doctors hesitate whether it is because of medication or another reason. Mechanism of action: An active ingredient that Mevacor contains is lovastatin. It is an inactive form of drug that usually doesn't have or has a little peculiar activity. When it is contained in vivo, it can by hydrolyzed to the acid of mevinolin, which is one of this ingredient's active metabolites. It resembles to hydroxymethylglutaryl CoA by structure. When lovastatin is hydrolyzed, it can compete for reductase of HMG-CoA with HMG-CoA. The amount of mevalonic acid, that is a forerunner of cholesterol is decreased when lovastatin interferes with activity of HMG-CoA reductase. This action is one of the reasons that produces cholesterol and it happens through hepatocyte. Cholesterol can be elevated from LDL during endocytosis. When the second mechanism is increased, the new cholesterol synthesis can be spoiled by lovastatin. LDL can be cleared very actively by using lovastatin. It is very effective with LDL and cholesterol, but triglycerides or HDL it doesn't treat that much. It is advisable to take lovastatin during evening hours even if the synthesis of cholesterol happens mainly in the morning. Serum concentration of CoQ10 can be reduced by inhibitors of HMG-CoA reductase, but unfortunately their clinical significance has not been proved. 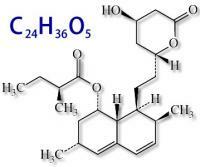 In 1970s they discovered two natural products that inhibit reductase of HMG-CoA. They are Lovastatin and Compactin. So they started to investigate them for using them as the real medicine to lower LDL cholesterol. Later, in 1982, they made more researches with lovastatin. This natural product was derived from polyketide and obtained from Aspergillus terreus. It was shown that this product helps to reduce the level of LDL cholesterol and the side effects were not very dangerous. Once the studies on animals were made, it was observed that lovastatin didn't show any toxicity connected with compactin, but they still continued to do the studies. After huge testings were made, it was approved that lovastatin was effective. It was observed that human body is tolerant to this medicine, so later in 1987 US FDA had approved it. Actually, FDA did not approve any other statin before. The amount of LDL cholesterol can be reduced on 40% if the patient takes each day 80mg of lovastatin, which is the maximum dose of this drug. The better effect will be if you take at the same time other treatments. The other important thing about the drug is that it almost didn't have any bad side effects. Patients accepted to take lovastatin very quickly. Rhabdomyolysis is the most dangerous side effect after taking this medicine. It usually occurs to people that also take inhibitor of HMG-CoA reductase. You can receive lovastatin from specific fungi, like Pleurotus ostreatus or as they also call the oyster mushrooms. They also made researches with extracts of oyster mushrooms, but most of them were made on laboratory animals. They made a few tests on the effectiveness on people and the results were satisfying. FDA had set a veto in 1998, on selling dietary supplements that were produced from red yeast rice and that had lovastatin in them. They claimed that these products that contain prescription agents should be approved too. Later this veto was repealed, by reason that natural products could not be patented. The first thing you should do, if you want to lower your cholesterol is change your lifestyle. Unfortunately there are people for whom exercises, dieting and control of weight is not enough. That is why some doctors prescribe medicine for lowering cholesterol in addition. Mevacor is one of these drugs. It really helps lots of people to lower cholesterol and has minor side effects. However, there were cases when patients experienced side effects and wanted to find out about alternative drugs, like another cholesterol medicines or statins. 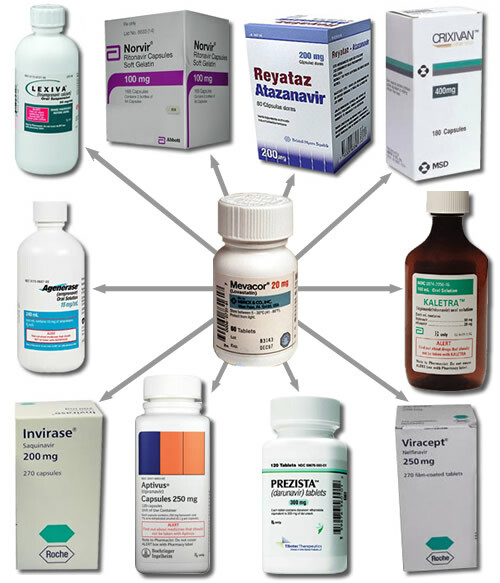 When patient takes Mevacor with niacin, miconazole and verapamil, there can take place some drug interactions and as a result, the person may have dangerous side effects. Your organism can metabolize the drug in a different way than it was supposed to, when it is combined with other medicine. You will increase the risk of having more problems with muscles and progressing of dangerous side effects. There are some interactions with this medicine that could develop the risk of having problems with muscles. When you feel weak, you feel the pain in your muscles that you can't understand, your body is too tender you should call your doctor. When you a running a temperature and sickness, it is more important to go to the hospital straightaway. The patient is incurring the risk to have pain in muscles, like rhabdomyolysis or myopathy when he takes Mevacor and aniodarone at the same time. You still need to visit a doctor so he will advise you on dosage and observe how you are getting cured. Try to avoid taking more than 40mg of this medicine a day. We know occurrences when a patient had a strong sickness in muscles, like rhabdomyolysis or myopathy taking colchicine and Mevacor together. May be your doctor will try to adjust the dose which is necessary for you and monitor the process of your recovery. It is forbidden to take Mevacor and cyclosporine at the same time. This combination can raise the risk of having problems with muscles and such diseases like rhabdomyolysis or myopathy. Mevacor treatment together with fibrates should be monitored very attentively. This combination can make more risks of having problems with muscles. A patient should also avoid taking Mevacor with such fibrate as gemfibrozil. Combination of this medicine with danazol will make the level of having problems with muscles more and develop such diseases as rhabdomyolysis or myopathy. Your doctor should make you more appointments to see how you are doing and the dosage should also be adjusted. If you take danazol, the recommended starting Mevacor dosage is 10 mg daily, and the maximum recommended dosage is 20 mg daily. The risk of having serious problems with muscles will be increased when the patient takes Mevacor and diltiazem. Such sicknesses as rhabdomyolisis or myopathy can also occur. Your doctor should make you more appointments to see how you are doing and the dosage should also be adjusted. When a patient takes Mevacor, he should start with 10mg dose per day. He should not take the amount of Mevacor more than 20mg. Try to avoid taking grapefruit supplements, eat grapefruit or drink its juice when you are getting treated with Mevacor, because you can increase the amount of this medicine in your organism. It may also lead to a number of serious problems with your muscles like rhabdomyolysis or myopathy and as a consequence, your kidneys will stop their work. If you still want to drink grapefruit juice and you are on Mevacor, ask your doctor what other cholesterol medications you may take. Mevacor and niacin are the medications that develop problems with muscles. So, that is why their combination can make more risk of serious side effects. Your doctor should observe you more often to see how is your progress and adjust your doses. Try to take the Mevacor dose not more that 20mg a day. Combination of this medication and nefazodone can bring unexpected problems with muscles. It is forbidden to take these two medicines together. Combination of any protease inhibitor and this medicine can bring unexpected problems with muscles. It is forbidden to take these two medicines together. We know about reports of cases when a patient that took ranolazine and Mevacor had problems with muscles like rhabdomyolysis or myopathy. The doctor should ask you to come visit him more often to observe you closely and adjust the amount of medicine you are taking. The amount of this drug in your body could be increased when you take some specific antibiotics. As a consequence, you will have more side effects from taking Mevacor. The most dangerous side effects could include rhabdomyolysis or myopathy. That is why, try to avoid taking these two medications together. It is better to take some other similar medicine instead. When you cant find other similar medication, we advise you to cancel the treatment with Mevacor for the time of antibiotics treatment. There are several antifungal drugs that can raise the amount of this drug in your organism and side effects will be more progressing and dangerous. The most harmful for your body can be rhabdomyolysis or myopathy. You must avoid taking these two medications together. It is better to take some other similar medicine instead. When you can't find other similar medication, we advise you to cancel the treatment with Mevacor for the time of antifungals treatment. When a patient takes Mevacor and veramil, he increases a risk to have myopathy and rhabdomyolysis or other problems with muscles. Try to control the dosage of Mevacor, when you use verapamil. Its amount a day should not be more than 20 mg. It may occur that warfarin can interact with Mevacor developing the chance of bleeding. You need to visit your doctor more seldom and ask him to make the necessary adjustments of your dose. Mevacor can interact with some medicines, but we are not sure if we told you about all the possible interactions above. So, before taking this medicine you should go to your doctor and ask him what applies to you. We also advise you to visit your doctor if you see that you have some problems with your muscles, like pain, weakness, or burning, because combination of Mevacor and other drugs may give such side effects. You should pay a special attention if you have sickness or fever. I had low cholesterol level (65 %). When I started to use Mevacor, I had a variety of side effects (muscle tendon pain in the wrists, fingers, shoulders, hips, knees, hands and thighs). Lipitior is better for me because it has NO side effects (in over a decade of usage). It is because diverse effects on diverse individuals. The side effects of Mevacor were really painful for me so I stopped to use it! A year later, I started to take Lipitor (20 mg). I tried different types of drugs which reduce levels of cholesterol in the blood. I began with Mevacor and then tested variety of other drugs. But I did not like them (first of all because of muscle aches), so I decided to use Mevacor.